The huntress is a ranged weapon specialist who devastates from afar, utilizing traps to help out in the fight. She has the greatest variety of weapons in the game, with features ranging from regular projectiles to ethereal bullets to flamethrowers. While it’s tempting to go all-guns with her, don’t count out her traps which cover a very wide range of functionality. The depth of her character doesn’t stop there (granted the differences between each weapon are pretty deep), there’s also her abilities and traps. While the Piercing Shot is definitely about destroying waves of enemies as they run towards the crystal, using Invisibility and spawning a proximity mine is a great way to destroy tons of enemies at once without being detected. The Huntress has traps for all occasions, one for explosions, one doing fire damage over time, a poisonous stun trap, a darkness trap which diverts enemies away from their current targets, and lastly a trap dealing massive damage to one enemy. It’s important to note that traps have a smaller trigger radius than their effective radius, so be sure to compensate for that when placing traps. Proximity Mine (40M) [3DU] – This proximity mine blows up when enemies enters its trigger radius, dealing serious damage to all enemies caught in the fire immediately after it blows up. The proximity mine is great for bosses or protecting areas where ogres will come. Since it only goes off once before having to reset, it’s important to put it in front of blockades or it won’t get enough chances to kill baddies. Gas Trap (30M) [3DU] – Stuns all enemies in the area for a period of time based on the strength of the trap. This one’s pretty brutal, as a general rule of thumb combining it with auras or inferno traps (which will be described below) or really anything that can take advantage of stunned enemies. This does count as a poison trap, so it won’t stop poison-resistant enemies, so be careful. The gas trap is especially useful during many of the challenges such as moving core and raining goblins. Inferno Trap (60M) [4DU] – The inferno trap is a staple Huntress trap along with the proximity mine doing fire damage over time in the affected area. The first three traps are sort of a trifecta, combine them all for maximum effects, and the inferno trap is very necessary in that. This damage over time trap is perfect when combined with the Monk as well, especially with enrage or electric auras. Since it’s damage over time, make sure enemies spend ample time on the trap during its activated time, it doesn’t have as much bang as the proximity mine so it needs to have good exposure. Ethereal Spike Trap (80M) [3DU] – Great for ogre or wyvern defense. Despite being floor-bound, the vertical trigger detection is quite high, and since it does massive damage, it’ll be perfect for taking out wyverns as long as they aren’t resistance to electricity. If wyverns aren’t a concern, focus on dealing massive damage to ogres! They’re expensive, but they don’t take up much DUs, so they can be placed without really hurting the overall defense strategy. However, when it comes to defending the main line at blockades, other traps are more useful (like inferno or proximity), use these for a specific purpose only. Especially bosses. Invisibility (15M, costs more over time) – Toggle this one on to avoid being detected by enemies, just as advertised. There’s several uses for it, but the main one is to get away from massive hordes, or to sneak behind them. Everything the Huntress can do normally can be done while invisible, including shooting, laying traps or healing. Some of the implementations thus are fairly obvious, going invisible and healing is always safe though it’s expensive. A fantastic strategy is combine invisibility and the Piercing Shot and get behind enemies blocked up at choke points for massive damage. Another one involves placing proximity mines right under enemies’ noses, which is great for taking out ogres. Piercing Shot (40M) – A pretty straightforward ability, activate it to do pretty good damage along a straight line away from the Huntress as it passes through enemies. Fire it from behind waves of enemies as they bunch up at the choke points or as they rush towards them. The Huntress has by far the greatest variety of weapons available beyond just stats. Different projectile types, different damage styles, different qualities, there’s just a lot going on. Some weapon types fire multiple shots, some have explosions, some pierce through enemies, some even pierce through walls! Each different type has a different use, some for taking out ogres and other meaty enemies, some for taking out massive waves of enemies. 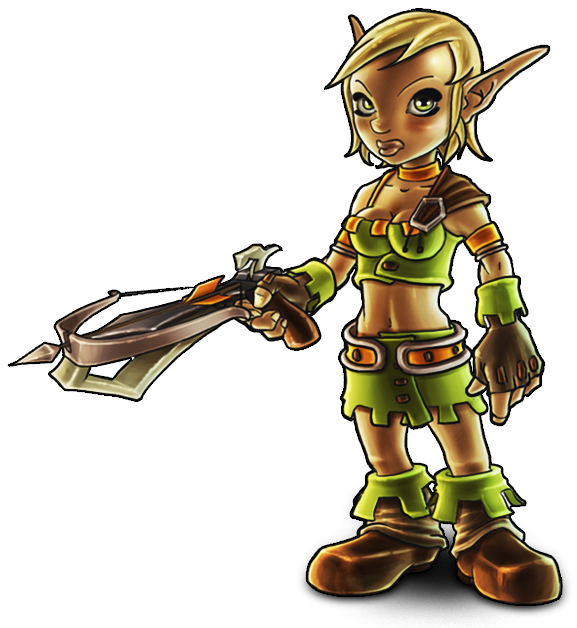 Crossbows – These vary in style greatly, but are the most common and usually pierce at least one enemy. Three-bolt Crossbows – These are just like crossbows but they fire three shots instead of one in a pretty tight angle. Dragon Cannons – These fire blasts of flame and blow up in a small area when they come into contact with an enemy dealing fire damage rather than physical damage. Muskets/Blunderbusses – These are pretty similar to crossbows, but tend to be slower and more powerful. Grenade Launchers – There are a couple different kinds, most of them are special loot, but they fire bouncing projectiles that cause large explosions on contact. Mining Lazer – Not sure if there are more than one of these, but it pierces through walls. Bird Cannons – These pierce for quite some time, and sometimes have inherent elemental properties to their base attack. The situations in which each different type of weapon excel are many, but it’s a good plan to have different weapons for backup, especially since the Dragon Cannons and Bird Cannons can be completely useless against certain elementally resistant enemies. Piercing weapons are incredibly helpful on levels with long pathways, but splash damage weapons are great in small quarters, where-as high damage low-piercing weapons are the best for bosses and ogres. Clip Capacity – This picture of a quiver indicates how many shots are in each clip. Clip capacity is pretty important, running out of ammo can be the difference between stopping a wave before the crystal and losing. Weapons with explosive properties love lots of ammo. Reload Speed – The electric-looking curved yellow arrow indicated reload speed, which is relative to the clip size. Reload speed really isn’t too different from clip capacity, but more basic weapons will want reload speed to keep up with constant damage. The Huntress is naturally fast, so putting stats in speed is going to be an even bigger boost. On top of that, the Huntress can get some pretty amazing single-enemy DPS, so attack damage is nice. The weapon-specific stats are definitely different per-weapon, so it’s a tough call there, but ultimately running with a regular musket or crossbow is the best plan until players have more experience with the Huntress. One incredibly important facet of weapons is the “shots per second” stat, which is the three waves symbol. Always upgrade that when possible. Chicken: Incubator – Fires bouncing explosive chickens, in homage to another Trendy Ent game. These chickens are inherently fire damage and provide massive knockback! Throne Room (Level 8 ) – W-1893 Voltmeter – Projectiles cause large blasts on impact. Summit (Level 12) – Flame Buffet – It’s a flame thrower. What else do you need to know? Glitterhelm (Level 13) – Mining Lazer – Fires through walls to hit enemies. Gunslinger: damage, speed, piercing shot – There’s really only one way to go when it comes to a Huntress hero build: DPS. That means tons and tons of damage! High speed is necessary to ensure that the entire map can be covered in a short amount of time to aid in danger zones, or to escape situations that become overwhelming. The Huntress has such inherently low health it’s not feasible to pour points into the health, but it may be done if death has become to frequent. Piercing shot points are perfect for this build as it’s great when used in conjunction with basic attacks in high-volume waves. This build is a ton of fun and takes the best advantage of all the Huntress’ awesome weapon varieties. Trapper: trap detonation count, trap strength, trap reset speed, casting speed – This is the purest of pure trap builds, focusing on dealing with heavy traffic over traps. The trapper build exists for when the traps will be the pre-blockade defense, rather than auras. The trap compounding, that is using proximity, gas and inferno traps all at once, result in some of the highest burst damage in the game (especially if combined with the ethereal spike trap). The trapper’s traps should be going off constantly, so casting speed is helpful for reloading them in the middle of the game. Along with defending blockades, this build is absolutely perfect for several challenges and for boss battles. Maimer: trap strength, trap radius, trap reset speed, casting speed – Damage, damage, damage! This build is all about hurting like crazy wherever it’s needed. Traps won’t be as necessary for defense as they will be for killing massive chunks of enemy waves. While the player might not place as many traps (for instance the gas trap might not be as necessary relative to the situation) they can place all the big damage traps to complement a tanky squire with high health towers that can’t put out much damage. This build also works really well in conjunction with strength drain auras from the Monk. Bullets and Bombs: trap strength, trap radius, hero damage, – Another really fun one involving doing absolutely as much damage as possible in every capacity. That means high DPS and high tower-power. While the Bullets & Bombs (B&B) build is a lot of fun, it needs to be backed by meaty towers and good support characters (like a Monk/Apprentice and a Squire for towers) or it won’t be able to sustain for long enough on the higher difficulties. When properly supported, however, this build will destroy in every single possible fashion, which, of course, is awesome. For traps, focus on proximity mines, inferno traps and ethereal spike traps, but all traps are affected by stats equally for the most part, so play with radius, reload speed and detonation count as desired. Warden: trap detonation count, trap strength, speed, casting speed – This is a hybrid support build focused around the trifecta of traps and some decent hero-based support, using speed to repair and place traps quickly and defend them when in a pinch. Build traps after blockades have been setup including gas and proximity, then inferno traps (don’t steal mana from the meat and potatoes tower placers, they’re more important) in front of the choke points. Splash damage weapons are recommended for support here, or anything with knockback, to make sure that the defenses don’t fall, because that’s the focus of this build. Ninja: invisibility, piercing shot, tower damage, hero damage – Sneaky sneaky is the way to go! Every character needs a strange build, and the Huntress has this one. Points in invisibility will allow it to be sustained longer, but it doesn’t need too many points, just enough to be usable for decent periods of time, say 30. Beyond that, this build is all about aiding the battle where necessary, getting rid of mages and massive amounts of enemies with craftily placed proximity mines and ethereal spike traps. On top of that, good DPS keeps this build being helpful when its main focus isn’t being engaged. Speed is a good stat to have here, but it’s not the focus.